The ジンギスカン king is back!! I had a friend visiting from Kanto and he loves Jinghis Khan, so out of the 4 days he was here we went out for it 3 times! As ever we did the nomi and tabehodai courses (all u can eat and drink) which provide the best value since we like to eat and drink a lot!! The other 2 restaurants I have already covered on here (Yozora and Hokkaido Beer Garden) so this time I took him to another of my favorite places, the Ginza Lion Beer Hall in the Sapporo Factory. Most tourists go to the Sapporo Beer-En, the complex that USED to be the old Sapporo beer factory. While the decor, atmosphere and the beer there is good, the meat is average at best and not worth the money IMO. This is not that place……..this is a little bit south and closer to the city centre, its the red brick warehouse that is attached to the gleaming, glass roofed shopping mall called "The Factory". There are a few different courses to suit most peoples tastes and wallet. We went for the 4 kinds of lamb course with the basic nomihodai. With a coupon from Hot Pepper that gets you 10% off the final bill, it comes in at 4000¥ per head for this meal plan. 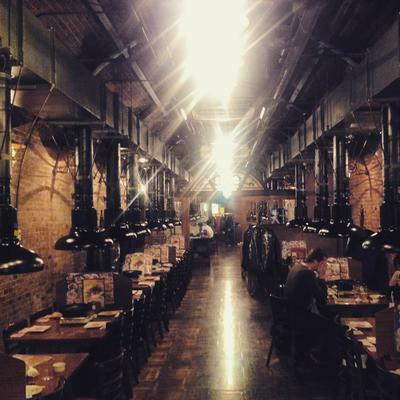 This beer hall certainly matches the more famous Sapporo Beer-en for decor and atmosphere, it looks like a German beer hall, long rooms that are crammed with tables and low lighting to give it a moody feel. The meat here is very good and you get plain old nama 生 Lamb, unadulterated and natural…….as God's butcher intended! You also get 3 marinated dishes….a shoyu (soy sauce) dish, salt dish and miso dish. All are pretty damned tasty, but personally I love the miso one! For an extra 700¥ you can get the 11 types of beer nomihodai plan…….I have yet to try this one (my mate isn't really a beer drinker) but its on the list and it won't be long, believe me!! The beers they have are……Sapporo Kuro Label, Classic, Yebisu, Yebisu Black, Yebisu Stout, Kaitakushi x 2, Edelpils, Sapporo Alt, Sapporo Red Star and a seasonal beer. This place isn't usually overly busy but it does close pretty early with last orders being at 9:30 for a 10pm close. In the summer time they have a beer garden outside and you can enjoy jinghis khan with their lovely beer in the warm sunshine .